The big crowd of fishemen reaping a harvest of tarpon at Barra Colorado lodges as reported here last week has dropped to near nothing, but apparently the fish are still around. Dan Wise reported from the Rio Colorado Lodge on Monday that Minnesota anglers Joe Pancotto and Anthony Nicklow, jumped four and had two to the boat soon after arriving late Feiday, and as of early Monday morning two other guests had two in the air but still nothing to the boat although they were still on the water as this was written. 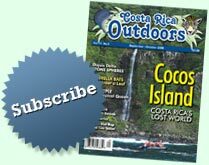 Big news in that area according to Dan is that the new Costa Rica fishing law has been upheld, as reported in the Tico Times last week. The law prohibits sport and commercial fishing in the martime protected zone and national parks, as reported last week in the Tico Times. That will likely have a profound affect on the fishing operators at Tortuguero. Fishing will not be permitted in the canal or in the protected ocen waters of that region, although it will not affect the lodges from Parismina north. Certain designated protection areas on the Pacific coast, particularly in the Golfito region, are also included in the closures and I will welcome comments as to if and how charter boat operators will be affected. Skippers and fishing operators on both coasts are invited to send me their comments, but the absurdity of suddenly closing areas to sportfishing while making commercial fishing plans for an immense corral of nets to entrap tuna by the tens of thousands appears ludicrous, at best. Some months ago, we had a bit of controversy going here regarding bonefish, and whether we have any in Costa Rica waters. We never were able to determine whether the species, popular in Florida waters and traditionally caught on the inshore flats on a fly rod or light tackle, had actually been caught here. Craig Shotton, from Canada, appers o have answered that question and emails a photo of a bonefish he caught on the Caribbean coast in 2001. “On this particular day, I saw several bonefish tailing (upwards of 30-40) of equivalent size on a flat that was maybe 300 yards by 150 yards. It was an exploratory trip and my time ran out as the tide was quickly changing,” he writes. “Since that time I have made a few trips to the same location but to no avail due to the conditions of the water, (heavy silt). As you can see from the photo, there is no mistake that Costa Rica does in fact have Bonefish. For 10 years I have been travelling to Costa Rica and every year I do some fishing.....although not as often as I'd like due to high costs. I've caught several species of fish while flyfishing in Costa Rica (some very strange), and plan to due more in the future. I'm certainly not the best fisherman in the world but I have fished for several years in various locations (including Belize for Bonefish and Permit) and have Guided many fisherman to some of the biggest Brown and Rainbow Trout that they have ever caught, while floating down the Bow River here in Calgary. If you ever make your way up to this (frozen) part of the world, I'd gladly take you down the Bow for a Drift Boat float trip.